Okay. I am so behind in posting my photos-a-day. I haven’t taken a photo every day either. But that’s okay. I’ve made up for the ones I’ve missed on other days. So my next few days will be trying to catch up. 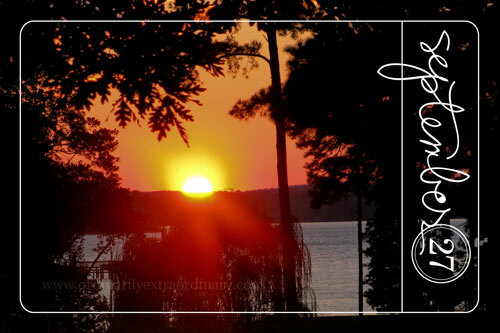 Monday, September 27, 2010 – Sunset over the lake. 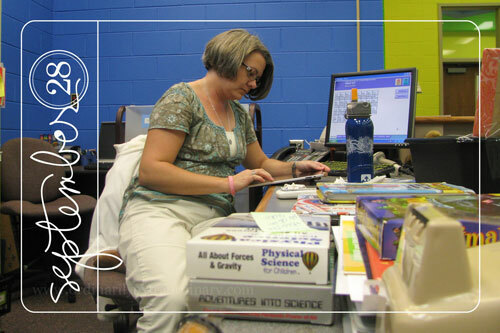 Tuesday, September 28, 2010 – Subbing in the library. Wednesday, September 29, 2010 – My skin for my IPad came today. Of course I ordered green. Thursday, September 30, 2010 – Half moon in the morning sky. Friday, October 1, 2010 – Whitney and Ben opening gifts at a wedding party. Sunday, October 3, 2010 – The Golden Rod is in bloom everywhere. One of my favorite things of Fall. Sunday, October 3, 2010 – Took some photos at the Artist Colony at Children’s Harbor. Monday, October 4, 2010 – It was cold out tonight so I decided that was reason enough to wear my awesome boots. Tuesday, October 5, 2010 – The lake was so blue this morning. Wednesday, October 6, 2010 – Having some work done on the van. Thursday, October 7, 2010 – Field trip with the gifted students to Moundville. Saturday, October 9, 2010 – View through my rear view mirrors. Don’t worry I stopped to take the photo. Another gorgeous sunset over the lake. Sunday, October 10, 2010 – Taking a photo of my pawpa’s fiddle with my piano for a painting I want to do soon. Monday, November 11, 2010 – Heading to exercise early in the morning and greeted by the sprinklers on the course. Tuesday, October 12, 2010 – The kitten caught a chipmunk. Anytime the kitten is outside the dog follows him around as much as possible trying to take care of him. Wednesday, October 13, 2010 – Early morning fog over the yard. Friday, October 15, 2010 – I met Lisa Leonard!! Love her jewelry! Friday, October 15, 2010 – Whitney and Ben at their rehearsal. Friday, October 15, 2010 – Ben’s sister Gretchen loved teasing Squirt about being her boyfriend. Saturday, October 16, 2010 – Whitney and Ben’s big day finally arrived. And of course my little squirt all dressed up for the wedding. Isn’t he handsome? Monday, October 18, 2010 – I traveled to Kentucky to spend a couple of days with a friend and attend a workshop on gifted children with her. Decided to stop in Downtown Franklin, TN for lunch. Such a great little area. Thursday, October 21, 2010 – Squirt doing homework. Friday, October 22, 2010 – A full moon. Saturday, October 23, 2010 – Squirt wrote a letter to our World Vision sponsor child. Sunday, October 24, 2010 – I love my little flats from Gap. Monday, October 25, 2010 – Our favorite tree, our Japanese Maple, isn’t its usual bright red this Fall. 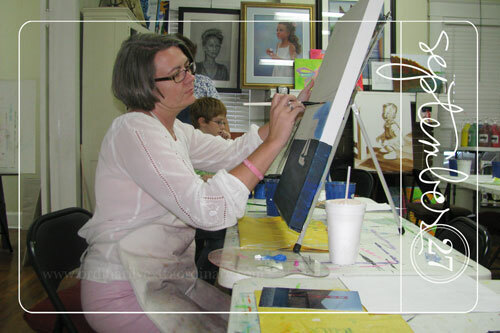 Monday, October 25, 2010 – Squirt starting a frog painting at art lessons. Tuesday, October 26, 2010 – Morning sky. Thursday, October 28, 2010 – Started knitting a scarf. Thursday, October 28, 2010 – As I was leaving after exercising this deer was right behind the guard house and just stopped and stared. Friday, October 29, 2010 – Asked one of the sweet teenagers I know to take some photos of me. Such a different experience being in front of the camera, but I wanted some new photos of me instead of more self-portraits in the mirrors.